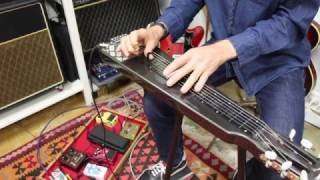 The Artist MSL110 Lap steel is a 6 string Metallic Black Lap steel with a Basswood body, with a rail pole pieced styled mini humbucker pickup, coil tap Push-&-Pull Tone control. This is a very popular Country Music Instrument. You would have heard this unique sound on many classic albums. It comes included with legs, a gig bag and even a tone bar. Everything you'll need to play right out of the box. ​Included Accessories: Gig bag, tone-bar and stand.